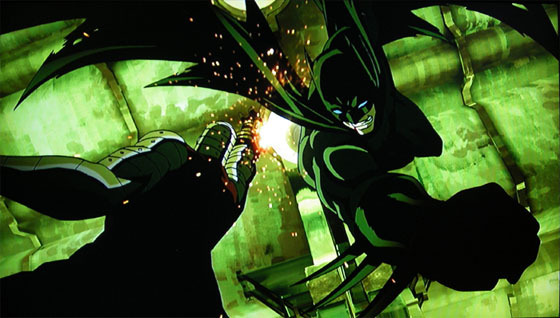 As with The Animatrix, GOTHAM KNIGHT is a bridge between the first movie BATMAN RETURNS and its upcoming sequel THE DARK KNIGHT. Besides the hints in the titles themselves (both share the obvious “knight”), there are some clues, elements and story parts that most likely will play a role in the second installment. For example, Batman has to deal with The Russians and their schemes, and there are two detectives which play a central role in “Crossfire”. In terms of violence GOTHAM KNIGHT certainly goes into a bold direction not seen in any animated form of Batman up to now. The most obvious one is the incorporation of the assassin Deadshot. Although he played a part in the animated series Justice League, he was never seen in a Batman movie or in an animated series of Batman. In terms of visual results of violence in general, GOTHAM KNIGHT, spirals its way up until it culminates at the end of “In Darkness Dwells” and at the beginning “Working through pain”. It is certainly something you have never seen in Batman: The Animated Series for example. Some might say this is not necessary yet I believe that this was a good decision, giving the hero an edge and a real world feeling. Regarding animation you can see that this movie was animated in Japan. Although each segment has its unique style and character designs, it is on the highest level of quality while never being truly western. The animation is almost all the time fluid with something on screen really being animated. Therefore you won’t get see those anime-style pan shots of standing characters doing nothing while the camera moves up to suggest animation. This movie had a budget and you can see it. 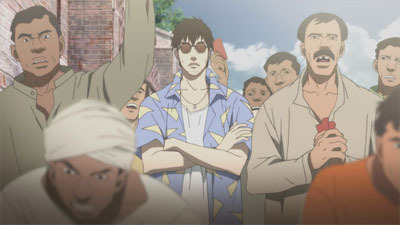 Both in animation and in the backgrounds. If you ever wanted to see a painted Gotham City full of details, this is the movie to go for. Out of all six segments “Crossfire” is by far the weakest in my eyes. 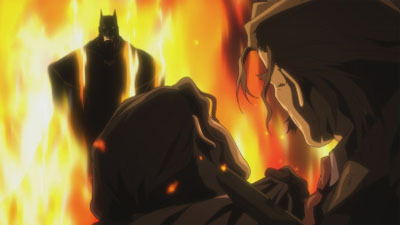 Being the second part after “Have I got a story for you”, this one also shows Batman only from the outside, as he is being seen by other people. While “Have I got…” focuses on normal kids telling their impressions, this part shows a pair of police officers talking about him while transporting a bad guy to the asylum before being thrown into a gang war. For some reason, writer Greg Rucka kept the plot and character interactions at its simplest. The dialogue got never truly interesting and in fact felt sometimes unoriginal (“He’s a vigilante” “He’s not” “He’s a vigilante, Anna” “He’s not”). “Crossfire” being a segment in which talking is taking place for some time it is almost unbelievable. Visually this segment heavily uses comic book framing and a three-color shading style with black shadows being everywhere. Unusual at first but it certainly gives this segment a harsh and dark feeling fitting for the Batman universe. Although the action part at the end is animated fluidly there are moments in which the suspension of disbelief simply didn’t work for me. In terms of suspension of disbelief, the slightly better segment “Field Test” is also not the best entry of this movie either. Here, Batman experiments with some kind of energy shield to deflect bullets and later uses it to fight some criminals at a dock of Gotham City. While the story itself doesn’t offer very much, “Field Test” at least sheds some light onto the gadget aspect of Batman who at the end refuses to use the shield because it can hurt others. It is an interesting take on the character which clearly connects his decision with the personal trauma he experienced as a kid when his parents got killed. It also adds some kind of heroism to him. On the visual side this segment can be regarded as the most “Japanese” of all six. The character designs as well as the coloring clearly stems from the eastern world – which certainly not everybody will like. For me, after the rather high contrast “Crossfire”, it is a nice and welcome change of style. “Deadshot” is the next in my list from bottom to top. As already mentioned this segment introduces us to the title-giving gun-using assassin, who is out on the hunt for Gordon. The segment itself is not too complex in terms of writing although writer Alan Burnett managed to incorporate Alfred into the story, as well as adding a nice mid-point reversal, which both make this short more interesting. Generally “Deadshot” is the most action and thriller-packed of all six segments: Batman first has to find Deadshot to prevent the killing of Gordon and then has to fight him. Nevertheless Burnett added some character moments, although you won’t learn much new in terms of Bruce Wayne and his trauma. At least the motif of guns is interwoven nicely…which is kind of necessary in my eyes regarding the main enemy of this segment. 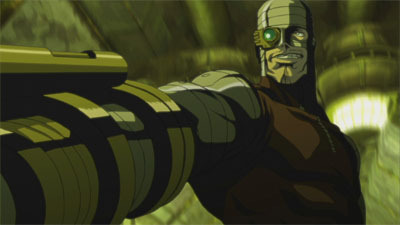 The general concept of “Deadshot” leads to many moments in which the animation company was able shine, putting some of the best animations into this part. 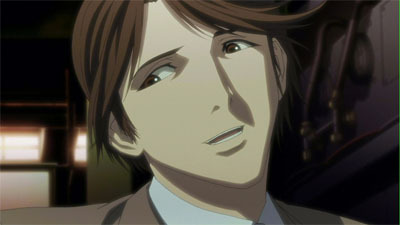 One major down-part is the rather unusual character design with some strange looking chins. “In Darkness dwells” focuses on the detective and logic reasoning skills of Batman as he searches for an abducted man in a strange network of a corpse transport system, resulting in an interesting contrast of logic and insanity. This gets increased eve more by the two main antagonists in this section, Killer Croc and Scarecrow. Again this short is rather straightforward but given the time of only 15 minutes the writer did accomplish a good result. Nevertheless, it was great to see how Batman kept a cool head and was continuously analyzing his surroundings as well as his own condition. Visually this part can be considered as the one with the highest contrast in the whole movie, resulting in a two color shading, whereas the second color is black all the time. The only exception I could spot was the moment Batman talks with the homeless people which incorporates some specular highlights. Although unusual at first, given the situation, it certainly fits the mood and in fact increases it even more. “Working through pain” for me is the second best short out of all six. This one seems to continue right off were “In Darkness dwells” finished. It shows Batman making his way out of the sewers (with a bad shot wound inflicted right at the beginning) while he remembers his training in India. This involves an enigmatic woman named Cassandra who teaches him techniques to sustain pain in all physical form. As with almost all other segments this one deals with a certain aspect of Batman, which this time is his training. Out of all well-known superheroes Batman is one of the rare that do not posses superhuman powers or is a genius in fighting. He needs training and indeed he does. “Working through pain” is in a way just like the training part in BATMAN BEGINS. And as in BATMAN BEGINS it helps to distinguish the character from the other heroes as well as making him more human (but not more normal of course). The visual style is in a way your typical anime look in terms of coloring. This means you most of the time get a more low-contrast, two-color-shading of the characters. In this regard “Working through pain” clearly stems away from the visual cues of the aforementioned other installments. The character designs are some of the best in the whole movie while the animation is fluid and great to look at. This segment also incorporates one of the most powerful images in the movie when Batman at the end is holding a mass of guns in his arms telling Alfred he cannot let go of them. Somehow it is a shame that they didn’t do something like that more often because this visual impression is wonderful and unusual. This segment (the first one in the movie) for me is by far the best segment of all six. This one cleverly plays with the different impression each person can have of one and the same character. In this case, it’s three of four skateboarders who each tell their encounter with Batman in a different stage of his fight against an unnamed enemy, each time emphasizing a different aspect of Batman. For the first kid, Batman is a strange creature which is more shadow than human, taking form and striking when appropriate, dissolving into a black mass when necessary. The second kid doesn’t see a human in a cape but a true bat, a man-sized beast, ready to rip apart its victim. For the third one, Batman is a robot full of gadgets ready to be used to defend the enemy. The fourth kid didn’t see him at all but right before the short finishes, he and the viewer finally gets a true look to the hero – who of course is everything and nothing of all at the same time. As already mentioned, each impression of the kids can be taken as a different (and enhanced) aspect or strength of the character we know as Batman. An interesting fact is that the villain doesn’t change throughout the whole segment, which puts the emphasis on Batman alone. The production team also went new ways in terms of visual design. Gotham City might never have looked more different than in this segment. Normally we follow Batman during the night showing a dangerous gothic city full of dark alleys and mobsters at every corner. This segment however places most of the plot in the broad daylight, changing drastically the whole mood of the city. We are no longer confronted with a dark city but a rather normal yet worn out industrial city which could be called rusty at best thanks to the color scheme in use here. Some design elements of the 40s and 50s help to increase this aged feeling. Moreover, because of the gothic elements still present in the images, the team prevented a hero looking out of place. In terms of character design, this segment also goes new ways. The characters are drawn in a flat, almost abstract aesthetic which might remind the one or the other of TEKKONKINKREET, a work in which the director of this segment was a part of. Although these designs seem to be the harsh contrast of everything else, they nevertheless accomplish to fit into the whole city scenery consisting of highly detailed background images. 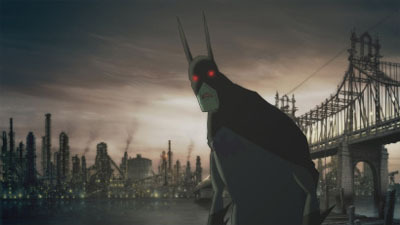 Although the animation is sometimes strange or seems lackluster (as with the mouth animation), “Have I got a story for you” nevertheless is one of the most experimental takes on Batman in a while. Perhaps even the first one not counting the two abysmal live-action movies before BATMAN BEGINS. This is a segment that not only pays tribute to the character and introduces us with certain aspects of him, but does this in a new way, too. Considering the fact, that Batman is a big million-dollar franchise that has to remain consistent to some degree, “Have I got a story for you” might be the only unusual approach you might ever see of Batman, be it animated or live action. 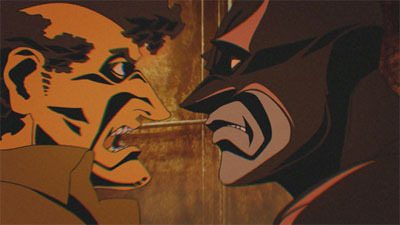 As a whole, the animated movie GOTHAM KNIGHT is able to deliver some very good shorts although it is being poised by some others. In terms of numbers the result looks like this: GOTHAM KNIGHT contains two rather bad segments, one mediocre and three being great to good, whereas the first segment “Have I got a story for you” wins hands downs. Regardless whether you are a fan of anime or not, any Batman fan or animation fan should consider buying the discs. For one, the qualities shown in this movie far outweigh the story problems, and for the other, the movie through its structure is diverse enough to offer something for almost everybody.